Well it’s been a very good week for me with plenty of different clients and plenty of trout both locally and in our backcountry. 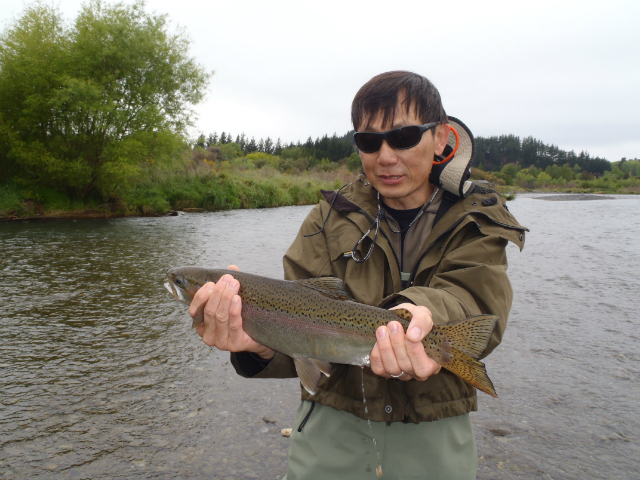 The best river for me and many others over the last few days has been the Tongariro with plenty of mixed fish coming to the net in both bright sunny conditions and rainy cold spells. This morning we received a healthy dump of snow on surrounding mountains which added a cold wind while on the lower river. The Tongariro dropped overnight to normal summer levels after running high for the last few days following the truck which flipped into a local river which runs into the Tongariro. Apparently nothing leaked from the truck into the river but yet they still flushed the river for days after it was cleared, some people are suspicious!! Fish are a very mixed bag in the river at the moment with most of them being spent or recovering fish after spawning this past season. In saying that every now and again a good silver fish comes to the net usually from deep swirly water like the Honeypot. Fresher fish are liking the cover of the deeper swirly water while the others are out in the open making the most of oxygenated water in the fast runs feeding on dislodged nymph life. In general fish are very easy to catch at the moment and some awesome sight fishing opportunities can be very exciting for novice and experienced anglers. I guided Eric and his wife Michelle from China today and witnessed something that doesn’t happen everyday. 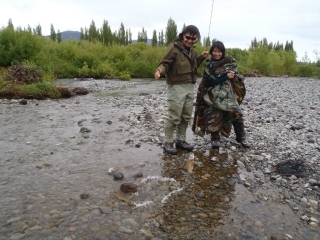 Lately I have been fishing two nymphs NZ style but also a dropper nymph about half way up the leader which acts as a emerger pattern. Literally the 2nd flick or roll of the line into a rifley run produced a double hook up with two fish over 3lb landed on the bank. Yes…….Eric hooked and landed two fish in one cast on two different nymphs!!! I could’nt believe my eyes when I saw two fish jumping in time with each other and was even more surprised to get them both to the bank without loosing one or both of them. In all my years of fly fishing I have never seen anything like this and I’m sure Eric will assume itÂ is the norm which is a bit of a shame but most of us will understand that some-days it’s hard enough catching two trout all day let alone two in one cast (a horrible cast at that):0. If you look close enough at the happy faces you can see two trout splashing about in the shallows. I also spent the morning with a group of guys from one of my booking agents which were in Turangi on a boys weekend and needed some guidance on where and how to snag a fish or two between other activities that guys weekends get up to. Again we enjoyed hooking into many fish from the riffles but also managed one very solid little fish from the deeper water of the Bain pool which found it’s way into the Bridge Lodge kitchen. Angler numbers are slightly higher over the past few days as many of the other Taupo rivers have been hard fishing with very low river conditions and gin clear water. 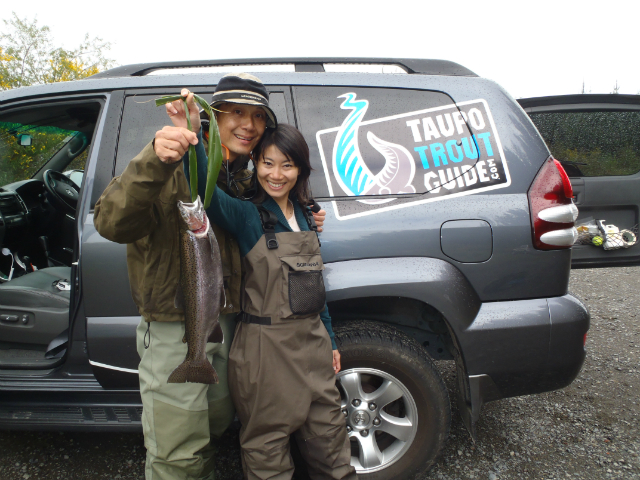 Most anglers seem to be ok and those who are moving about and trying new things are having great success. I saw a fishing report during the week which mentioned how well the local rivers were fishing and it was a great time to be in the area enjoying large pieces of river before the busy season arrives at Christmas time which I agreed on. But I must admit I can not agree on the next sentence which stated that the Tongariro had plenty of big Browns in the system which were chasing and feeding on juvenile Rainbow trout. I have not seen a Brown in the river as yet but they wont be far away and after many years of angling for browns and killing my fair share I have notÂ ever seen a small rainbow in ones stomach. This topic gets bought up with Doc every season and they use the poor old Brown trout as an excuse for a decline in Rainbow trout numbers so I hope we don’t see anymore reports like that one which I find hard to be correct or true. Another good week is in line and if you get out there I’m sure you too will find some great sport.